Hello everyone ! 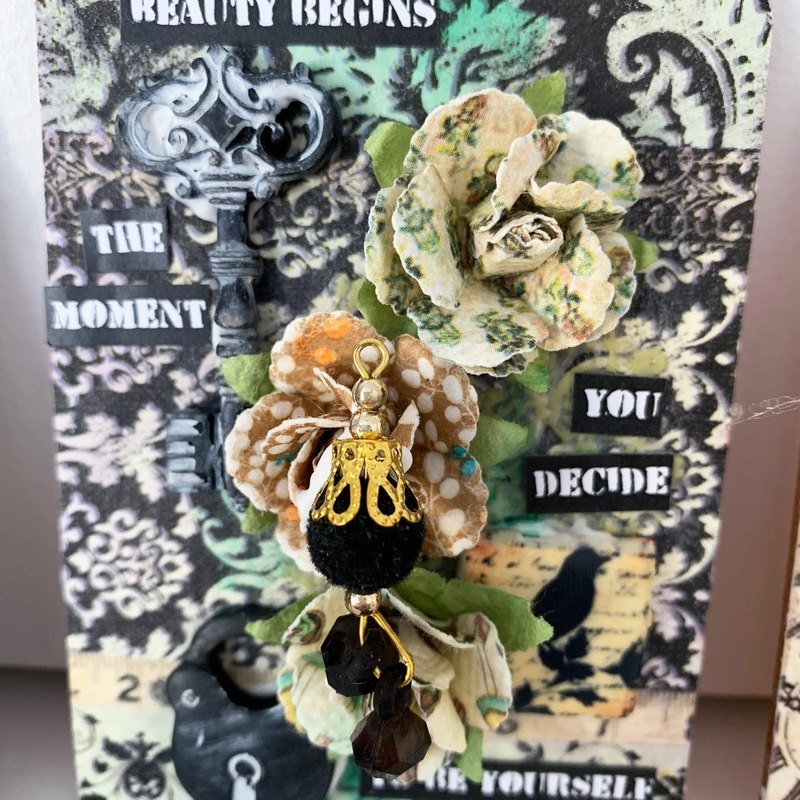 Today I am sharing my second project for this month, this time with the Cards Tags and more Kit which is filled with beautiful products from Graphic 45, Creative Embellishments and Scrappy cat. 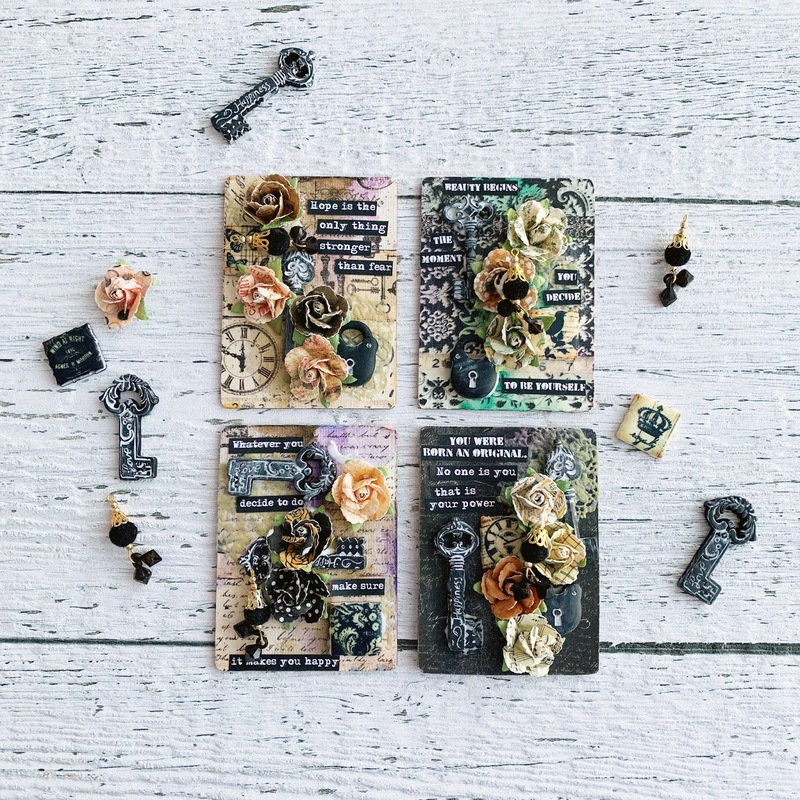 If you want all the details of the kit you can find it at the end of this post. I made 3 cards for this project, all 8×4 approximately. I used 3 different background papers and 3 other papers on top. 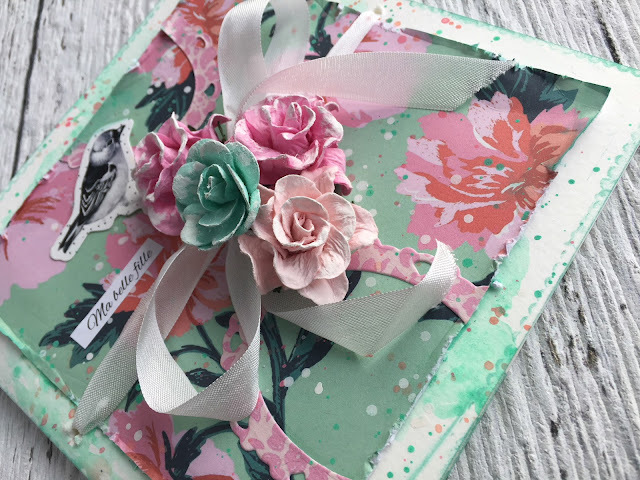 I used the cute tags and pockets to add embellishments to the card along with the beautiful Red flowers. 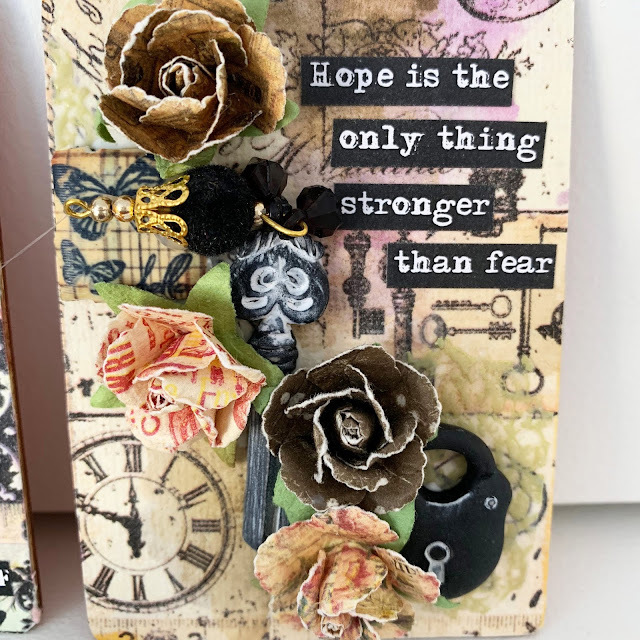 I painted the music notes with the gray ink from the Scrapbook Kit. The sentiments are from my stash. On each flower I used the glitter glue included in the kit, I think it gives great texture. Hey everyone, Kim here. 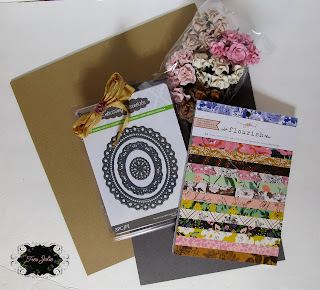 Today I am going to share my first projects from the Card, Tags and more kit. 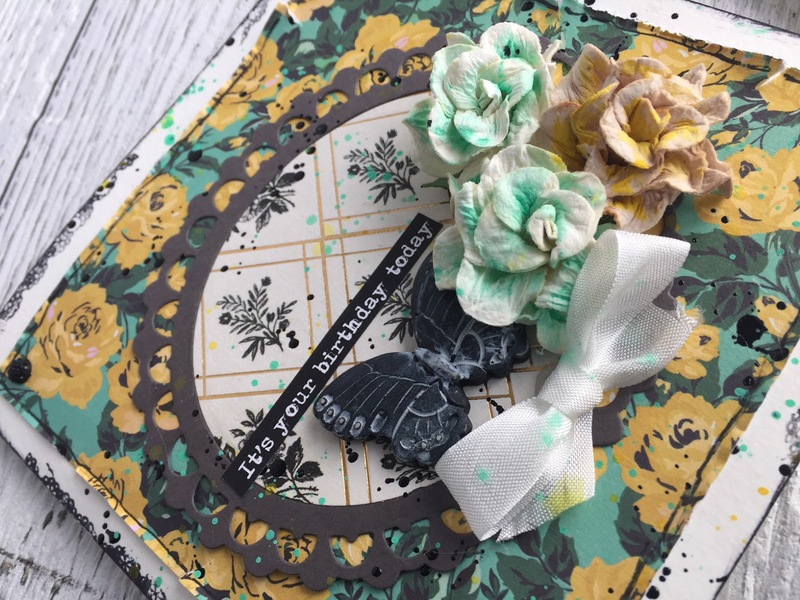 This kit is full of beautiful papers and ephemera from Lemoncraft. 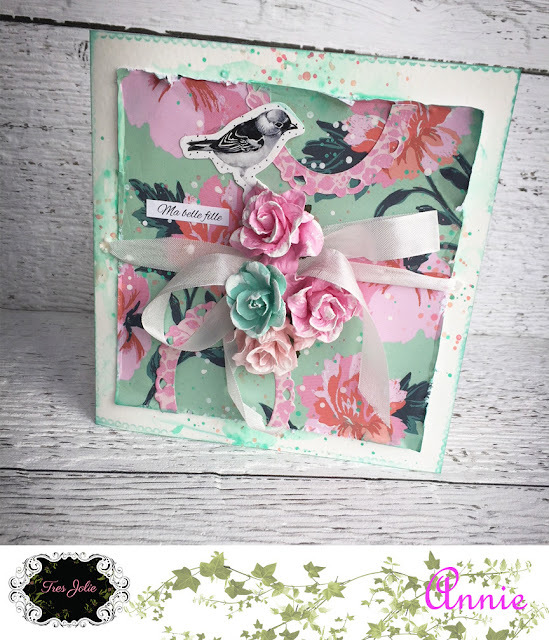 This kit is filled with lots of paper to create plenty of Shabby Chic Easter and Spring cards. Plus plenty of embellishments (for a full list of contents see here). I love the soft colors of these papers. 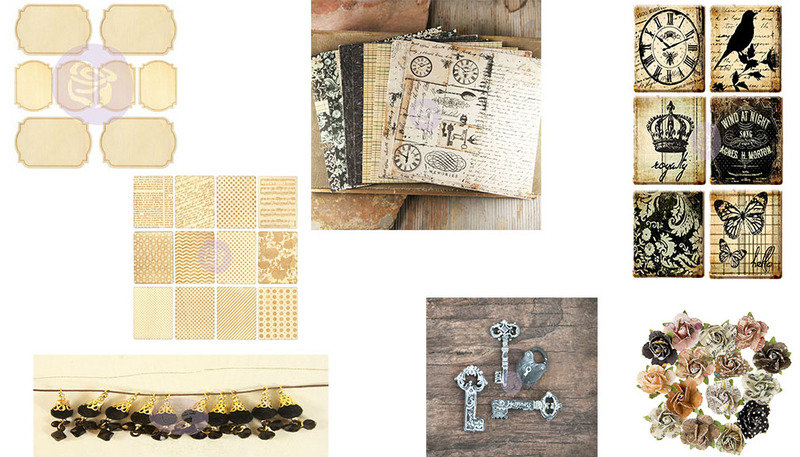 The basics complement the pattern paper so well. I used one of my favorite doily die cuts on both cards. I also cut out some pieces from the ephemera sheets to use as embellishments. The chipboard swirls are from the kit and I just left them naked. 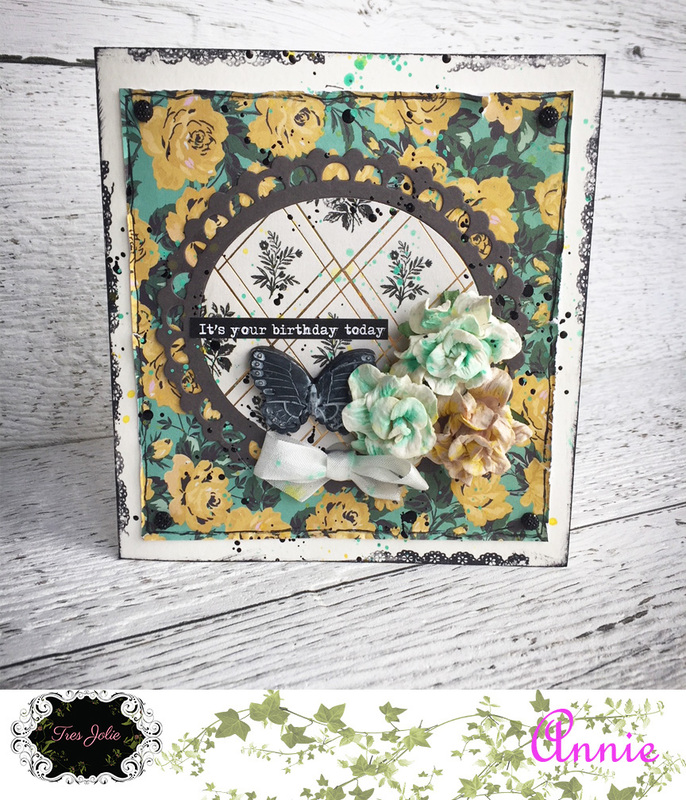 The white lace is a leftover piece from a past kit. Today’s tip: Use pieces of foam tape in between your paper layers to add dimensions. I used a thinner foam tape so the cards weren’t to bulky and it turned out nice. 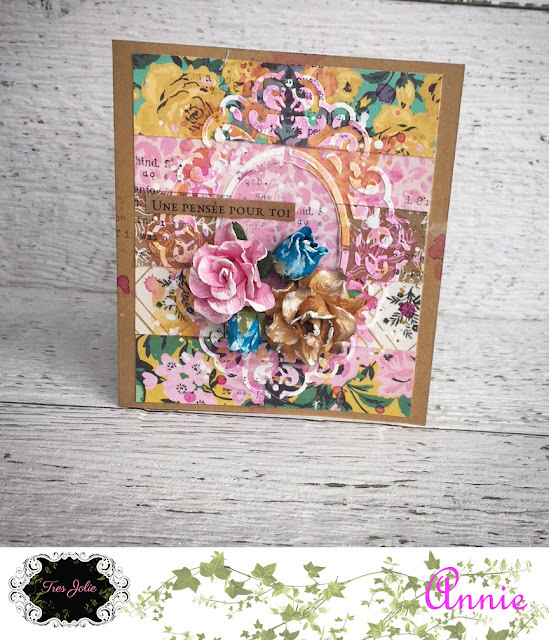 I was able to stick my die cuts between the layers and my cards were still able to fit in an envelope. Hello everyone !! 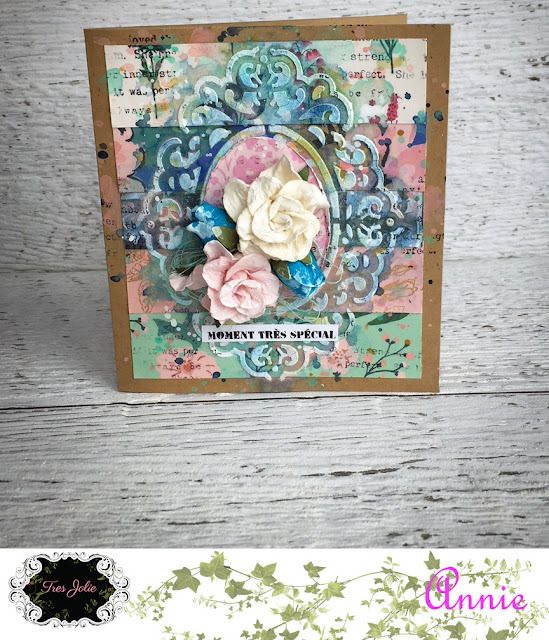 I am presenting today some cards that I made with this beautiful March kit ! 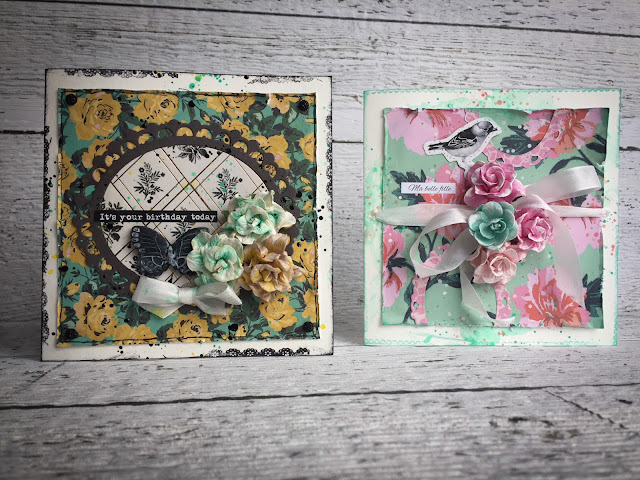 Beautiful products from LemonCraft, Prima Marketing and Creative Embellishments. I made 3 different cards with both 12×12 and 6×6 papers. 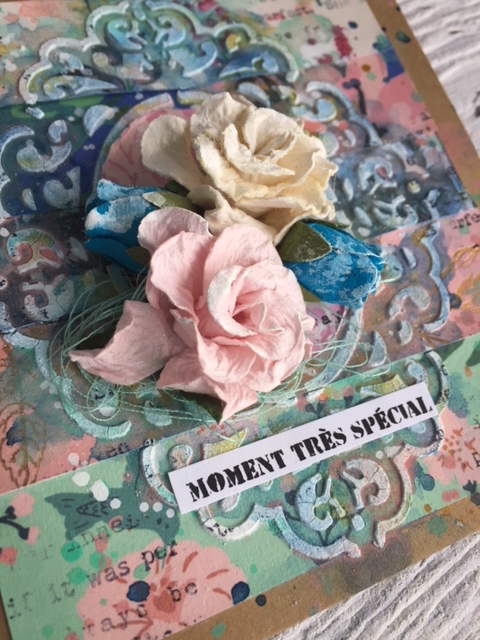 I embossed the mini swirls with 3 different powders from my stash. I cut out the beautiful peaces of ephemera for all 3 cards. Hello everyone ! 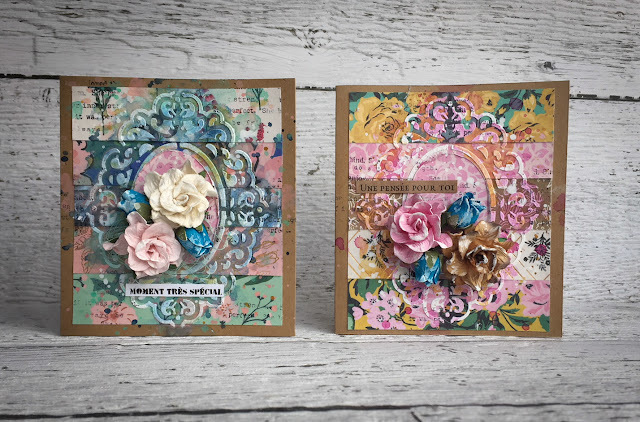 Here I am today sharing 2 sets of cards made with September’s card kit. 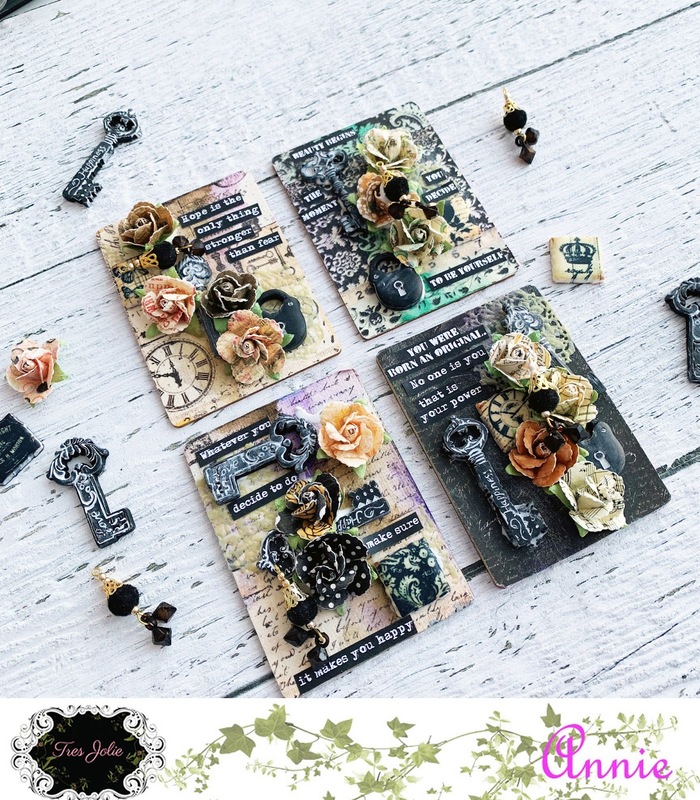 You have cardstock, Maggie Holmes paper pack, flowers, lace and a set of dies ! For both cards, I pretty much used the same techniques. I chose 5 different patterned papers from the paper pad and glued them on the cardstock. 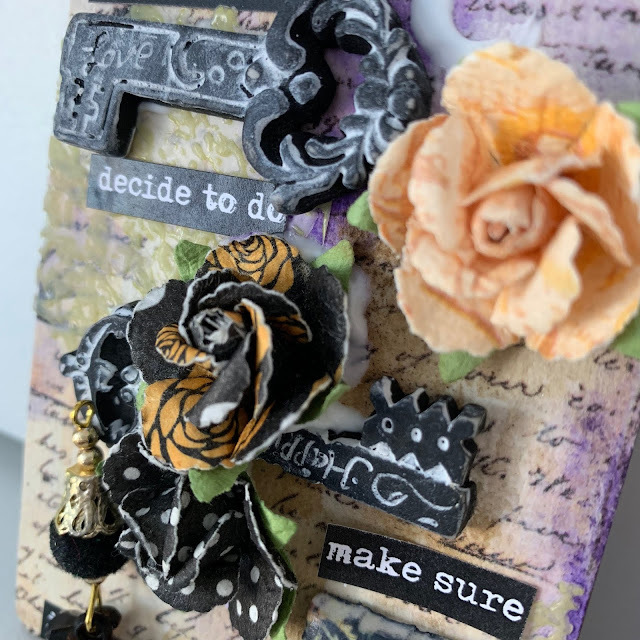 Then I used the stencil that came with a Prima flower pack from the Scrapbook kit and used it on the papers with Modeling Paste. 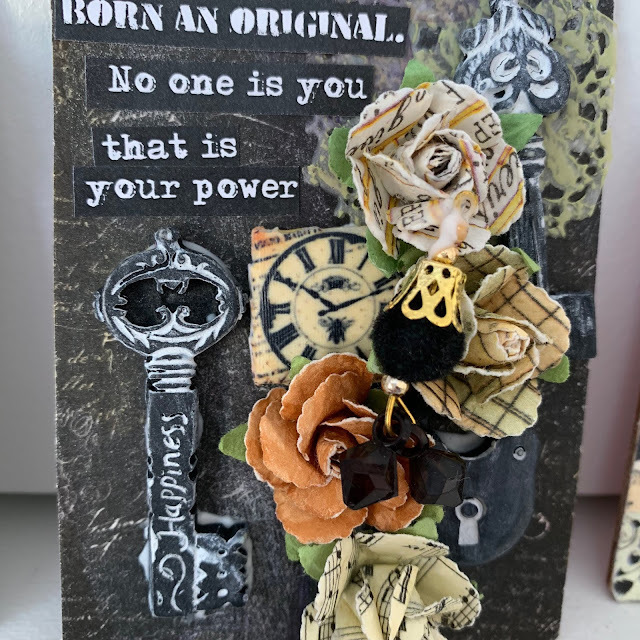 I used a stamp from my stash as well as sprays to create texture. 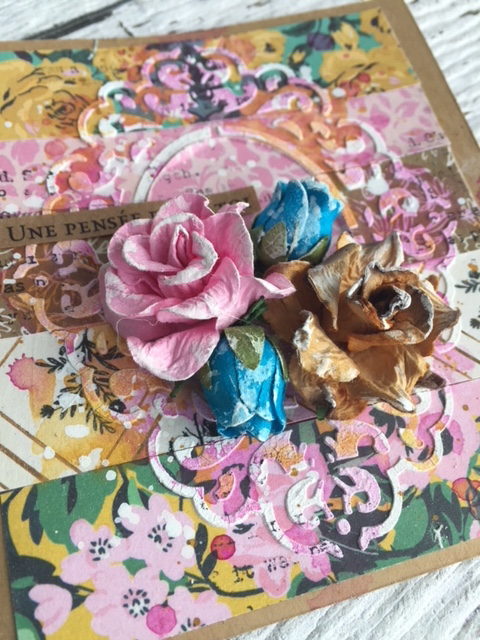 At the end I finished with flowers and added some Gesso on the flowers. For the next 2 cards, I used a white background and a border stamp from my stash. I chose two different papers for each card and put a frame made with the die cuts. Added some flowers and embellishments from the Scrapbook kit and finished with splashes of color.